Hi lovelies! I have something exciting to show you all today. 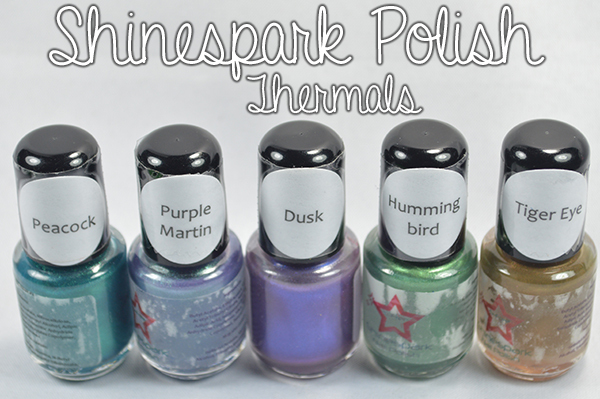 Shinespark polish has an upcoming summer collection that features 5 thermals and 5 photochromes. You may have guess from the pic, today I'm going to show you the thermals! Dusk is what I would describe as a pinkish indigo in it's natural state. When it's cold it turns to a beautiful dark bluish purple. I think the thermal transition was amazing with this one! First coat is thin, but it builds up nicely. This is 3 coats. Hummingbird is my favorite from the bunch and has the best color transition IMO. In it's warm state its a sage green, when it's cold it shifts to an emerald green. Perfect representation of a hummingbird! 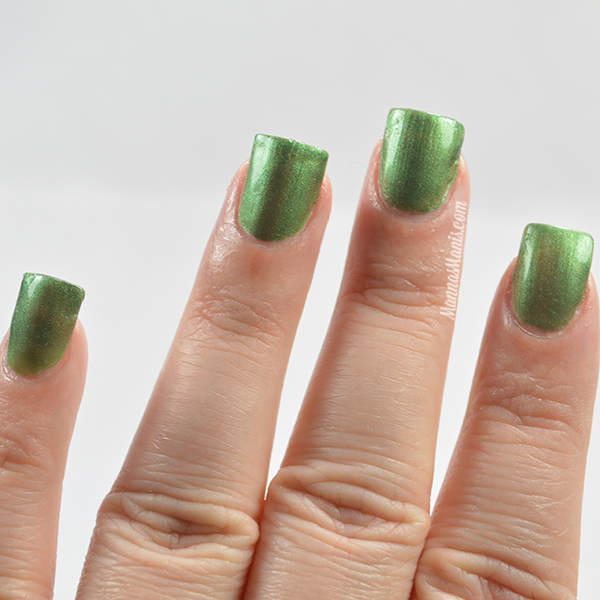 This is 3 coats. Peacock is a gorgeous dark turquoise in it's natural (warm) state and shifts to kind of a dark teal when it's cold. This is 2 coats. Tiger Eye is a copper brown when it's warm, and shifts to a darker brown when it's cold. 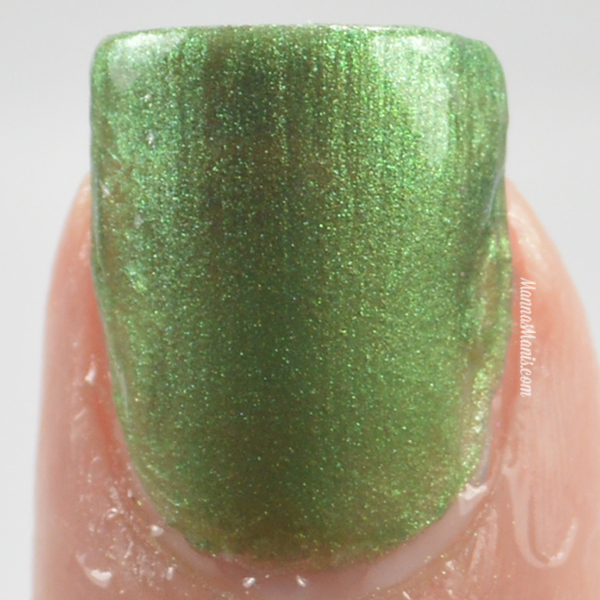 The color shift in this one was very subtle for me, I had a hard time getting it to transition. This is 2 coats. Purple Martin is the one I had a lot of issues with. BUT, I contacted Molly, and there had been a mix up when she was bottling, and I got a bad batch. The issue was fixed immediately and she also sent me a freebie for my troubles. Fantastic customer service? CHECK. Purple Martin is what I would describe as a lilac in it's hot state and shifts to lavender in it's cold state. The transition is subtle, but noticeable IRL. This is 3 coats. The Light, The Heat collection releases April 29th at 10:00 A.M. CDT. 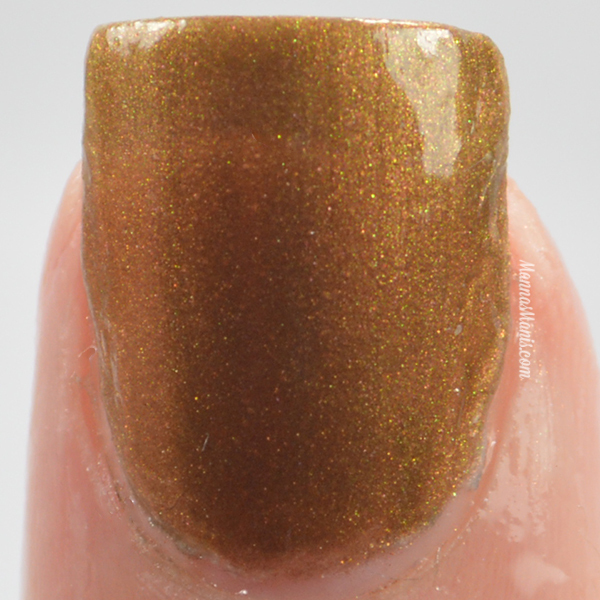 Stay tuned for the second half of this collection featuring the photochrome polishes which color shift in the sunlight! I haven't been able to swatch them yet because it has been doing nothing but raining here lately!